Recruitment is central to the maintenance of any plant population, particularly in disturbed or drought-prone environments. Recruitment relies on both seedling emergence and subsequent survival to establishment, processes susceptible to changes in soil water potential. Here, we use an existing relationship between seedling survivorship and soil water potential from the TasFACE global change impacts experiment situated in Tasmanian grassland, elucidate relationships between rainfall and soil water potential, and then simulate seedling survivorship responses to potential changes in both the amount and seasonal distribution of precipitation. Annual rainfall was a poor predictor of survivorship, suggesting the importance of seasonal and daily distribution of rain in determining establishment patterns. Modelled seedling survivorship was remarkably resistant to declines in rainfall, with a rainfall reduction of 40% reducing survivorship only by ~10%. 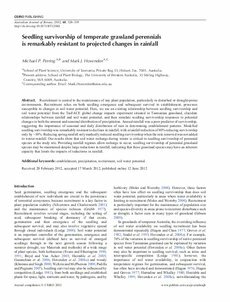 Reducing spring rainfall only markedly reduced seedling survivorship when the rain removed was not added to winter rainfall. Our results show that soil water recharge during winter is critical to seedling survivorship of perennial species at the study site. Providing rainfall regimes allow recharge to occur, seedling survivorship of perennial grassland species may be maintained despite large reductions in rainfall, indicating that these grassland species may have an inherent capacity that limits the impacts of reductions in rainfall.